NORTH ANDOVER, Mass. - In one of the most anticipated Hockey East matchups of the weekend, the Merrimack College women's ice hockey program tied #10 Boston University, 3-3. The Warriors led until the final minute of the third period, where a late Terrier goal sent the game to overtime. The Warriors struck first, seeing junior Mikyla Grant-Mentis tally her fourth straight goal just three minutes into the first period; the Terriers responded with two goals of its own before the period was over. A goal from senior Jessica Bonfe highlighted the second period, and senior Katelyn Rae picked up her first goal of the weekend to give the Warriors a one-goal advantage. With just over a minute left in the third, Sammy Davis squeaked a shot past senior netminder Samantha Ridgewell. Despite the five minute overtime period, neither team could find the back of the net. Ridgewell gave up three goals, stopping 35 shots - including 16 in the final period. Goal #1 (1-0 MC) - She had all three Friday night, and was the Warrior to start the scoring Saturday. Just three minutes into the game, she received a feed from Julia MacLean; her shot hit the right shoulder of Terrier netminder Corrine Schroeder and fluttered in, giving Merrimack an early advantage. Goal #2 (1-1) - The Terriers tied things up with under five minutes to go in the first period. Kristina Schuler buried her third goal in the last two games after a beautiful feed from Nara Elia. Goal #3 (1-2 BU) - The Terriers took the lead with under two minutes left in the first frame. 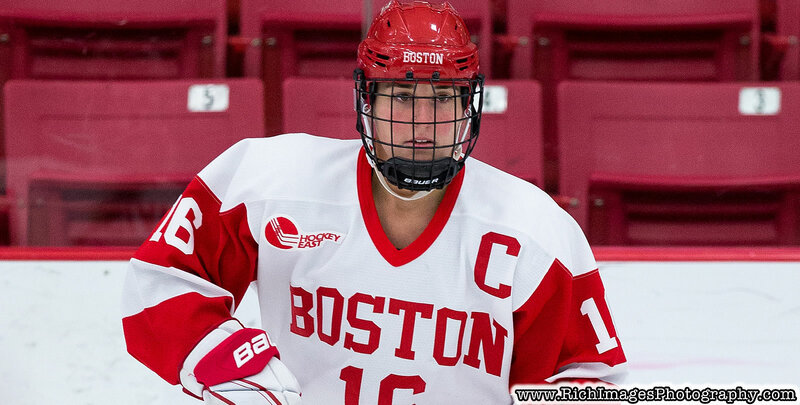 Abby Cook fired a rocket from the blue line during Boston University's first power play of the afternoon, giving the visitors an advantage headed into the second period. Goal #4 (2-2) - Senior Jessica Bonfe has brought the intensity all year, and her game-tying goal at the midway point in Saturday's contest proved it. Her seventh of the season put some life inside Lawler Rink with 11 minutes left in the second period. Goal #5 (3-2 MC) - The Warriors were on the positive end of a crazy scrum outside the BU goal, resulting in a goal to retake the lead. Katelyn Rae got credit for the tally after junior Chloe Cook's clapper from the blue line was deflected. Goal #6 (3-3) - With an extra attacker on, the Terriers knotted things up with one minute left in regulation. Sammy Davis was able to muscle the puck past Ridgewell for the leveler. - There were three lead changes throughout the course of the game. - Grant-Mentis recorded her second 5+ point weekend performance, recording four goals and an assist against BU. - Merrimack has just two ties in Hockey East play; both of which against the Terriers. The Warriors play just one game next weekend, closing out its season series with Providence. Puck drop on Friday, February 1, is slated for 5 p.m inside Lawler Rink.